Go green with the solar indoor& outdoor dummy security camera from us. It can be used to increase security presence for your home or business yet it is way more cost-effective than real ones. The built in flashing LED light enhances the presence of the camera and helps you deter all the potential criminals away. Note: Any problem about SANNCE CCTV product, pls feel free to contact us via Customer questions & answers or Amazon message or support@mysannce.com. ☻Give your family and home a boost: Keep closer eyes on things in a more cost-effective way. This durable dummy security camera is built with durable quality and just looks exactly the same as actual ones, but it is way cheaper than real ones. ☻Widely used application: No installation restrictions, install it anywhere without cabling needed and no need to find any electrical socket. It is suitable to use both indoors and outdoors. ☻Save money for high-cost home security: Using it in combination with real security cameras can be a brilliant trick. 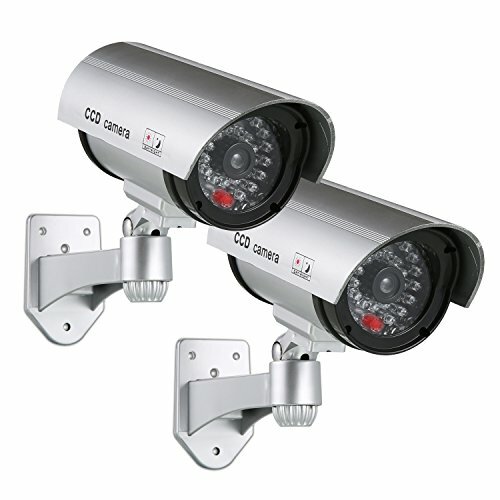 It can reduce large cost for a video security system. ☻Amazing flashing light makes it like a real security camera: Blinking red LED powered by solar or 2pcs AA batteries saves more power and makes sure it is able to work normally on a cloudy or raining day. Have everyone believes your house is monitored 24/7 continuously. 7/24 365 days technical support by SANNCE.You could also get timely reply via amazon message or email to support@mysannce.com and techsecurite@hotmail.com.